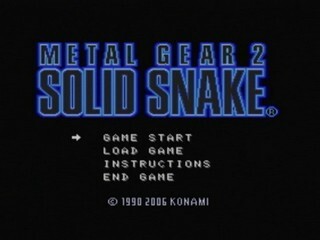 Released for the MSX in July 1990, and then rerelased for various platforms with MGS3: Subsistence, Metal Gear 2: Solid Snake is the sequel to one of the first stealth games in history and a substantial update on the formula. It broke new ground in stealth mechanics, boss battles, long stairways that take hours to traverse, memory shape alloy keys, deadly poisonous Zanzibar Hamsters and the main villain actually being Sean Connery. You may recognize some of these as appearing in future Metal Gear games. Best European version Big Boss time: Single-segment 0:51:29 by 'Jaguar King' on 2014-04-28. There is nothing much to say about this run, it all depends on good planning and how to approach and pass certain areas. the bosses are easy if you know how to deal with them, except for 3 bosses that are RNG Heavy: Black Ninja, Jungle Evil and Big Boss. endangering your big boss rank. by few seconds depending on the RNG of the bosses. speedrun the games I love.